The fifth volume in CSA Word's massively popular complete and unabridged ‘Short Stories’ collection is bound to please. 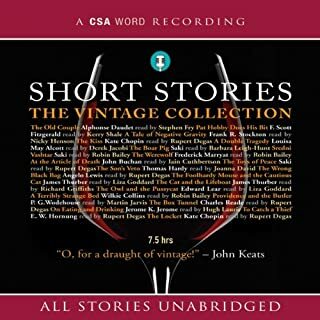 With something for everyone this collection of classic stories read by only the best-suited and most established readers will delight the ears as a vintage wine excites the gullet; The Vintage Collection is audible gold. Features eye-catching typographical series design. 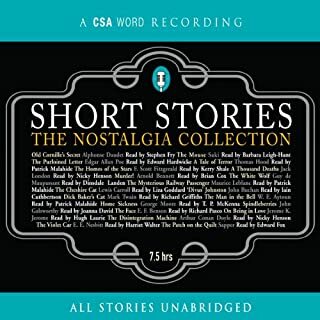 This wonderful collection of 18 short stories includes work by some of literature's most treasured names, including Mark Twain, Edgar Allan Poe, James Joyce, Virginia Woolf, F. Scott Fitzgerald, Oscar Wilde, and many more. This superlative treasury includes "The Cask of Amontillado" by Edgar Allan Poe; "A Piece of String" by Guy Le Maupassant; "The Story of an Hour" by Kate Chopin; "The Mark on the Wall" by Virginia Woolf; "Nuns at Lunch" by Aldous Huxley, and many more! cracking stories, but no table of contents! 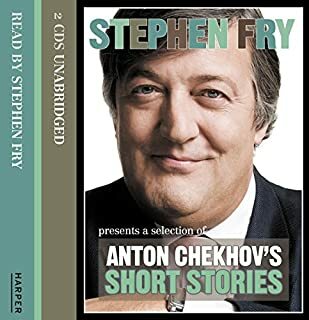 Immerse yourself in a world where the illuminating Stephen Fry reads some of the more memorable short stories of our time. A brilliant combination of reader and writer come together in these short stories available on digital download. Exclusive audio collection. Eleven Max Carrados stories - narrated by national treasure Stephen Fry. Max Carrados featured in a series of mystery stories that first appeared in 1914. Carrados featured alongside Sherlock Holmes in The Strand magazine, in which they both had top billing. The character often boasted how being blind meant his other senses were heightened. This exclusive audio collection features 11 Max Carrados stories. Stephen Fry presents this intriguing programme charting the history of knowledge, how technology changes our relationship with it, and how we know what we knowKnowledge. The Google generation thinks it doesn’t need to carry much of it around in its head any more. Much has already been written about the internet changing the way we think and learn. But is knowledge less valuable than it used to be? A great new collection of classic short fiction, brilliantly read by a selection of narrators. Includes the following stories: "The Lightening-Rod Man" by Herman Melville, "One of the Missing" by Ambrose Bierce, "The Leopard Man's Story" by Jack London, "Tennessee's Partner" by Bret Harte, "The New Catacomb" by Sir Arthur Conan Doyle, "A Pair of Silk Stockings" by Kate Chopin, "My Watch" and "The Widow's Protest" by Mark Twain, "An Ideal Family" by Kate Mansfield, "A Painful Case" by James Joyce, "Small Fry" by Anton Chekhov, and more! 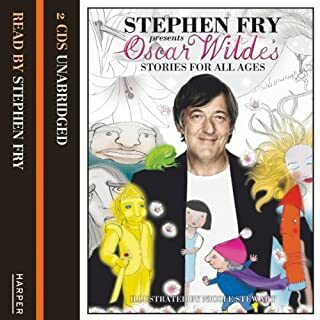 This fine collection of intelligent, unabridged short stories about intriguing, interesting and sometimes inspirational men is an audio treat for young and old, male or female. 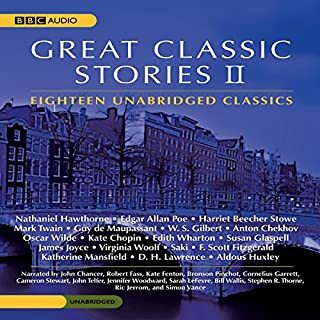 A carefully compiled anthology featuring timeless tales from classic authors including Charles Dickens, F. Scott Fitzgerald and Anton Chekhov, read by a cast of acclaimed and respected actors, including Stephen Fry, Martin Jarvis and Kerry Shale; this compilation will be enjoyed by the whole family. Daudet's atmospheric Letters from a Windmill, combined with Jerome K. Jerome's wonderfully idle ramblings. He was indeed the original founder of The Idler and famous for his classic novel Three Men and a Boat. They are icons of the literary world whose soaring works have been discussed and analyzed in countless classrooms, homes, and pubs. Yet for most listeners, the living, breathing human beings behind the classics have remained unknown - until now. In this utterly captivating audiobook, Dr. Elliot Engel, a leading authority on the lives of great authors, illuminates the fascinating and flawed members of literature's elite. In lieu of stuffy biographical sketches, Engel provides fascinating anecdotes. This six-part comedy series was first broadcast on BBC Radio 4 in 1988. Hosted by Stephen Fry, accompanied each week by Hugh Laurie, Jim Broadbent, Emma Thompson, and a selection of guests including Phyllida Law, Robert Bathurst, Julia Hills, and Alison Steadman, the show takes the form of a roundtable discussion, interspersed with sketches that veer tangentially from the sublime to the ridiculous. This collection was previously published as Short Stories: The Ultimate Classic Collection. The previous reviewer must have done something wrong, because I got nearly 8 hours of audio. Great narrators & great stories. As you might expect with a variety pack, the quality of story and the quality of narration varies. Probably does not have the best work from any of the authors. But enjoyable overall. Helped me through a long drive. ... or maybe just not for me. I truly enjoyed only one or two of the stories in this collection. Some off the rest were downright unpleasant, including the flattest and at the same time the most horrifying ghost story I have ever read. There's also an story by Conan Doyle (not a Sherlock Holmes story) that I found unentertaining. And if you're looking for laughs at the expense of the Downton Abbey set, skip this collection and go back to Wodehouse. 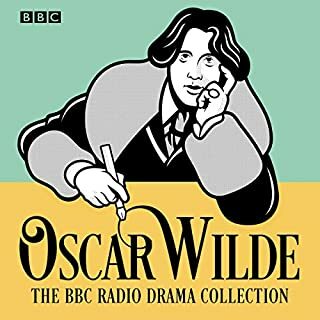 I was attracted by the star-studded cast including Sir Derek Jacobi, Stephen Fry, Martin Jarvis and Nigel Hawthorne... and was disappointed these talented narrators performed some of the shortest pieces.These (and a few other narrators) delivered inspired performances, compared to a handful of others that were laughably amateurish. After a few minutes of listening, I had to skip over those.The production value was often substandard (including clicks, mouth noises, audible gasping breaths, and even one bizarre mispronunciation). Very disappointed. Too much horror, not enough "literature"
I'm currently a student in an MFA in Creative Writing program, with a focus on short story. I was sorry that so many of these stories were in the "horror" genre. 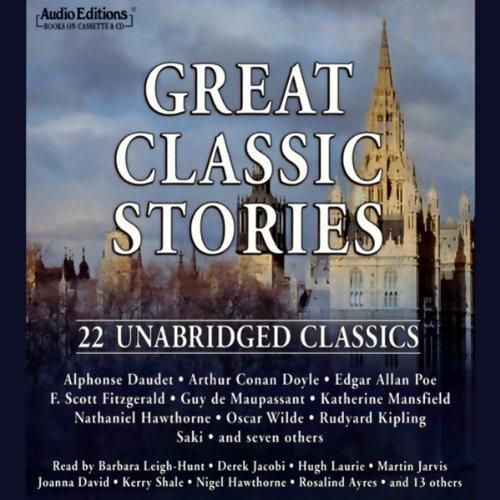 Would you consider the audio edition of Great Classic Stories to be better than the print version? Great stories that make you want to listen to them from your easy chair by the fire with a hot beverage and a big bowl of buttered popcorn at hand. Cozy stories from Victorian England thereabouts and narrated by British actors you know. Nigel Hawthorne, Stephen Fry and Hugh Laurie for three. Each one is delightful and paints a word picture of life in Olde England. They are all second to none. I was rather shocked when I downloaded this Audiobook to discover how much it had been cut down. While it say in my library, it claimed to have 7 hours of stories, while the Audible version only had the first hour and a half. I could only bear the first two stories. The voice is not appealing and the stories are dull.